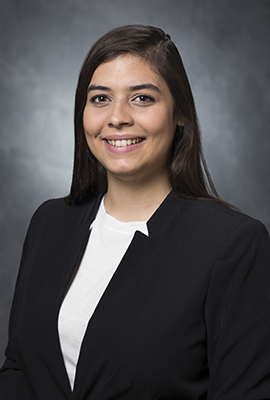 Laura M. Roqueta joined the University of Georgia School of Law as its student engagement coordinator in 2018. In this Career Development Office position, she drafts student newsletters, assists with professional development events, and distributes resources and CDO related information. Previously she worked in advertising and social media in Puerto Rico. At AGS Medical Billing, she was a social media coordinator and billing specialist. She also worked for Hip Hop Fashion Boutique as their social media manager and customer service specialist, where she sought to expand the company’s online image by overseeing its digital advertising campaigns and managing its Facebook and Instagram accounts. Laura earned her Bachelor of Arts in public relations and advertising from the Universidad de Puerto Rico in 2017. While studying, she participated in a student exchange program at the Universidad Compultense de Madrid in Spain.